The Big Ten has opened conference play early for the second consecutive season and No. 19 Ohio State and Illinois meet at the United Center in Chicago on Wednesday, which will be the home of the Big Ten Tournament in March. Here are five things to watch for in Wednesday’s game. OSU’s 7-1 start has been fueled by the play of sophomore Kaleb Wesson and senior C.J. Jackson. Wesson has amassed double digits in points in six of eight games and has shot 50 percent, while Jackson has chipped in with 13.3 PPG. 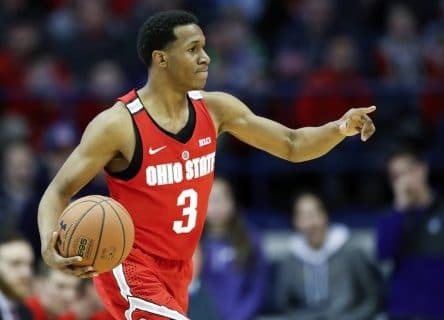 Behind a successful team lies a glue guy and Wake Forest graduate transfer Keyshawn Woods has served that role for Ohio State. Woods has averaged 3.0 assists per game and produced a season-high 19 points in a 69-60 win at Creighton on Nov. 15. Despite a 79-59 beatdown of Minnesota on Dec. 2, Woods played his worst game of the season going scoreless on 0-of-5 from the field in 29 minutes. Expect a bounce back effort from Woods on Wednesday as he has provided stability in the backcourt. The sophomore guard has come into his own this season with a team-high 14.7 points per game. On the other hand, Frazier was virtually a non-factor in the Illini’s loss to the Nebraska Cornhuskers on Sunday with nine points, on 3-of-7 from the field. As the depth of the Big Ten has improved this season, Illinois will need to get Frazier more involved in the offense if it has any hope of beating teams such as Ohio State. With a mesh of four returning scholarship players, transfers and freshmen, the chemistry has not been there for the Illini as they are off to their worst start in 40 seasons at 2-6. While being competitive in losses to Georgetown, then-No. 3 Gonzaga and Notre Dame, Illinois will need to breakthrough sooner rather than later with one of the toughest schedules in the country. Since the 1994-95 season, the United Center has served as the home away from home the Illini and is an opportunity for some players to return home and play in front of family and friends. Aaron Jordan, Ayo Dosunmu, Drew Cayce and Samson Oladimeji all played in the Chicagoland area.